This is part three of a four part journey on The Road to Service Financial Management. The previous blogs in this series; the Anatomy of a Service Portfolio and Building Complete Services explored some of the lesser understood concepts of service management and set the stage for how to leverage “services” to show value and change the dialog with your customers and partners. This leads to a service investment mindset that places IT at the table with business leaders for more meaningful discussions that focus on what IT services they want to buy instead of why IT costs so much. In this article we are going to extend the service value discussion into the realm of IT Financial Management (ITFM). The question becomes, how to link your services to a financial model that also shows value. Producers of business services or products struggle to understand value if they don’t understand cost. The costs need to relate to the services provided. A typical problem we observe in many IT organizations is the “shortcut” of tracking costs by functional towers. They track how much money is spent on network gear, servers, storage, and associated 3rd party maintenance and may further track functional team costs like engineering or production support, but they then struggle to relate this data to the actual services provided to their customers. This leads business people to question the validity of the cost of IT and ultimately to budget decisions disconnected from the realities of the services provided. Building a cost model that reflects the services you provide is the key to unlocking the service value you provide. When you do this your customers will start thinking in terms of what you provide that supports their business and how you can help them with their business needs. ITFM can be seen as a progression that starts with simple accounting cost pools and functional costs that can be rolled up to service cost and finally to business service costs. Here are some guidelines on building a cost model that will help your organization unlock service value. Keeping your services simple and easy to understand for your customers will also make it easier to construct a cost model. It is okay to begin with services at a broader level such as Network Connectivity, Desktop Services, Storage, Application Hosting, and Security. Remember there is no one right way to setup your services, but they should show value that your customers can understand. Services aligned to functional departments is a good place to start, but be careful, categories of cost such as engineering, operations, or architecture are not services, so additional thought needs to go into how your customers perceive value. Cost categories like engineering, architecture, and support are typically bundled in as part of other services. For example, all three of these disciplines (engineering, architecture, and support) are necessary to provide network access, which is a standard service offering. Security and Help Desk can stand alone or be with other services – though it is simpler to show these as separate services. 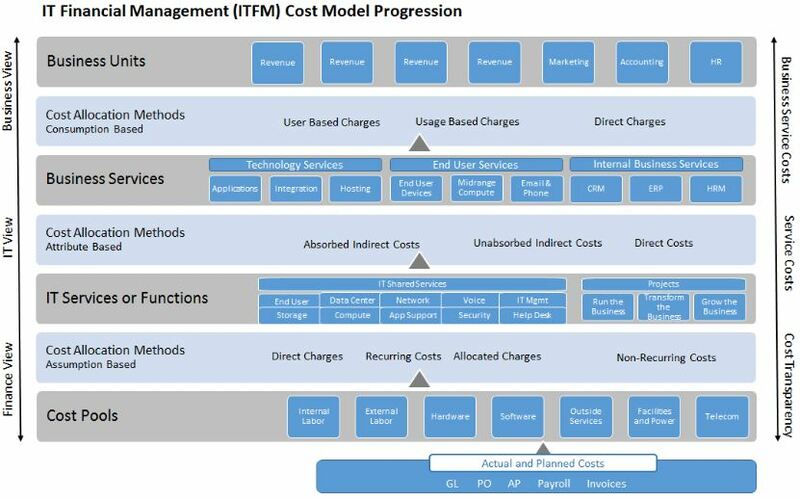 The model below shows a progression that starts with simple cost collection that you’re probably familiar with and progressively moves up the stack until you connect with the business services that produce revenue (or directly touch the customer and user base). As you move through this progression, you translate costs and align them more closely to your services, progressing all the way up to the business perspective. Moving from GL accounts to cost pools is usually an easy early step and will begin to show cost transparency. Moving up from there, functional cost can then be exposed, so they can be bundled and translated into functional services. Many one-time costs and can be identified, documented, and passed on directly to a customer requesting it. You can also track project costs and begin to understand projects in a service context by asking what service are we introducing or changing with this project. Whether the project is to improve security, enhance an application, or add more storage; these project costs should be related to the services they support and managed as investments in your services. Non-Project costs can be approached by looking at recurring costs. These costs can be termed “Run the Business” costs. Look to understand the main drivers of recurring costs such as maintenance, licensing, and connectivity charges and then focus on managing these costs in a logical grouping of services. Typically the largest recurring cost category is people costs, which includes wages, benefits, training, travel and expenses – all things associated to people. This is usually the hardest to allocate directly to services. Many times the same category of people can support multiple services. People costs are captured based on skill set and are usually broken down to functional teams like project management, engineering, architecture, or operations. Further specialty breakdowns include network, storage, security, servers, etc. This can be leveraged as you begin to allocate these functional costs to services. An example of an allocation mechanism is shown below with indirect functional cost down the left side and services across the top. Start by estimating the cost to support these services on an ongoing sustained basis over a year. For example, engineering may estimate that they spend 30% of their time on the Network Access service. This estimate does not need to be 100% accurate, but it does need to be fair and defendable. Remember that in this model you are only looking at the portion of the recurring costs that are indirect. Most direct costs can be captured and charged to a specific customer. This includes one-time project costs. As you group costs into Services, you can allocate them out to the business units that receive these services. This is best done based on how the services are consumed. In some cases this can be simple, like a headcount allocation (e.g. ; information Security or Desktop Services in the example above). Other methods will be needed for services that have a more direct usage profile like storage space, bandwidth, processing, etc. Getting help with these mechanisms with someone that has experience can greatly help. Monitoring tools can also help to capture information that can be translated into usage activity. As you get more comfortable with your costs and the cost drivers, you can adjust your accounting and cost collection mechanism to capture actual costs. Below is another cost model example that includes both Run the Business (RTB) and Investment based costs. Using this model, the revenue generating businesses can see where IT cost is relative to the services they consume and whether the cost is an Investment or RTB type. This helps the service provider expose how much cost and effort is related to investments in new business and enhancements vs. running the existing. Note that this model captures the portion of IT services consumed by Internal Business Operations and allocates it back to the revenue producing businesses as an overhead. This is a not a rule, but one method for tracking and budgeting those costs. Once you have a mechanism in place, you can leverage it to do budget forecasting. Knowing your service costs and the associated consumption will make the budgeting process much more transparent. Instead of trying to defend your costs with little correlation to business value, you can now show where the costs are related to the services being consumed. The conversation now turns to what services you offer and how much do they want to buy? You are unlocking value by focusing on “services” – a common language that bridges the gap between the underlying technology and the capabilities your customer needs to support their business. Having service costs will greatly change the dialogue with the business and naturally show the value you are providing.